Your enterprise information is the most heterogeneous, omnipresent and probably promising asset of your company. But how to leverage it? Before we can answer this question, we first need to ask ourselves “what is enterprise information?”. At CAMELOT we distinguish four types of relevant information that can be internal or external to the enterprise. Let’s start with the probably oldest type of information: intangible information. Ever since humans can think, information is in the people’s heads in the form of thoughts and memories. Some information is somehow shared with others, some is not. However, before humans were capable of communicating via symbols, via drawing or in written, detailed information was not saved in an analog form. Even today, some valuable business information resides solely in people’s brains. The potential of this information remains untapped as long as it is intangible for the enterprise. Over time more and more information was captured in analog form so that it was saved and could be shared with others as analog information. Even in our days, there is a massive amount of business information that is still existing within companies in analog form. This information could be analyzed by using latest technologies to gain insights and to create business value. With the rise of bits and bytes digitalization kicked off and is continuously increasing speed. In a narrow sense, digitalization simply implies that information is shifting from an analog medium to a digital one. In a broader sense, it means that analog processes (e.g. writing a letter) are replaced by digital processes (e.g. writing an E-Mail). This leads to continuous growth of structured and unstructured digital information. 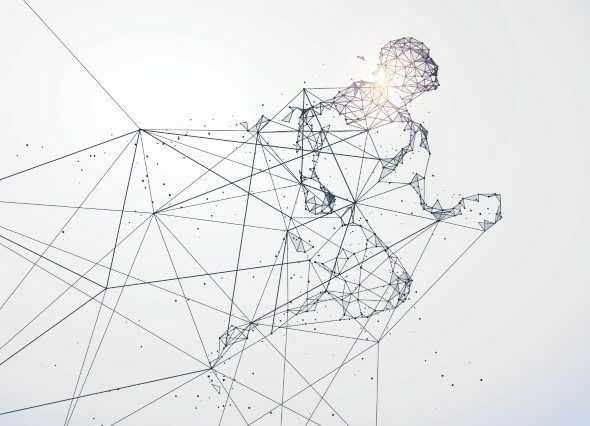 This development is further accelerated by a global phenomenon called digital transformation: new innovative technological capabilities are dramatically changing the way we live in all areas of life. Structured digital information that is stored in the form of data in tables/databases is typically used for business transactions, reporting and decision making. As far as this type of information is concerned companies are still facing challenges like data harmonization, consolidation and operational excellence. However, this data inherits huge potential for competitive cost advantages if correct, complete, consistent, unique and valid data is ensured. Unstructured digital information is getting high attention since the hype around big data. Companies aim to analyze unstructured data (such as meter data, pictures, natural language, etc.) to describe and understand coherences, to draw predictions or to even induce desirable future scenarios. Even in 2017, most companies are still at the start of generating value out of unstructured data. It appears that they are not yet able to create a differential competitive advantage out of unstructured data, although the huge potential of this type of information is commonly known. Despite the fact that information appears to be very heterogeneous, all types of information can serve as an enabler for the company’s success in achieving strategic objectives such as revenue growth, cost saving, and new innovative business models. Our experience shows that if companies want to successfully leverage information as an asset in the long run, a comprehensive approach is required that covers all types of information. 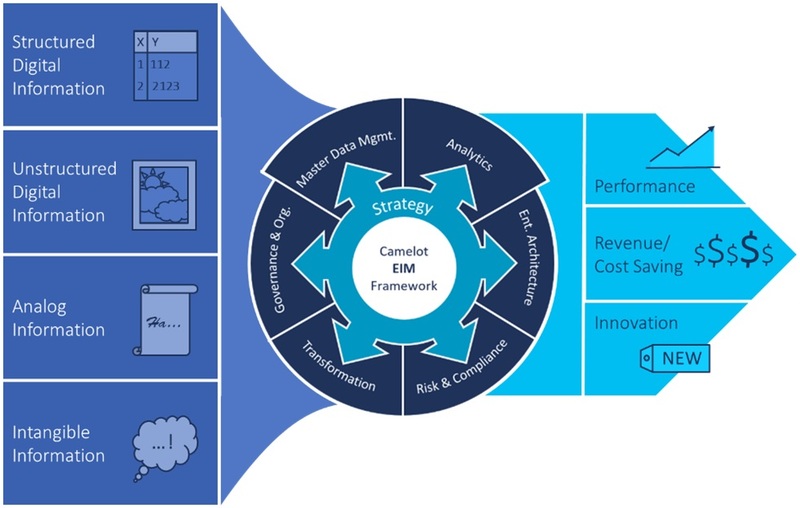 The CAMELOT EIM framework is a holistic approach for best practice EIM to realize, manage and control information related initiatives across the company. It is based on 20 years’ of consulting experience in this subject. The scope of the framework covers all EIM relevant areas and provides clear guidance on how to identify, assess, scope and manage all information related topics within your organization.